The cave "Strašna Peć" is the first tourist destination in the northern Dalmatia and is among the first caves opened for visitors in Croatia. There is an old myth telling us about how the cave came into existence; "Once upon the time, fairies decided to cut the island of Dugi Otok in half. They worked hard and chiped every stone all night long, but just when they were about to finish, the dawn prevented their plans. The island of Dugi Otok stayed safe, and the cave Strašna Peć reamined a recollection on that unavailing attempt." 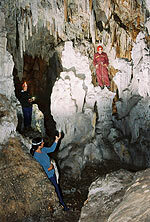 The cave "Strašna Peć" is first mentioed back in 1898. in the Zadar paper called "Il Dalmata" after the first speleological research was performed.Shortly thereafter in 1904. Austrian magazine "Ilustrierte Österreichische RivieraZeitung" writes about the cave, this articles brought the first visitors to the Strašna Peć cave. This first visitors came to the island of Dugi Otok by a old staemboats form the port of Zadar. Prince Edward with the royal british family. "We were muddy, dirty and bloody from all the wriggleing and crawling between the stone blocks. But nevertheless, we were not sorry. We were enchanted by her beauties. 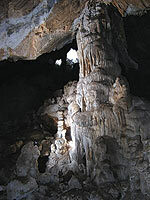 We met the harmony of nature creation and realized that the cave really is "Scary" as her name tells us (strašna; eng. scary)"; Mirko Malez 1953.god. The cave Strašna Peć is located on the island of Dugi Otok, in north Dalmatian archipelago. South of the town of Savar on the west coast of the island. The cave entrance is 65 meters above the sea level, facing south, between the mount Šišljevica (273 m) i Veli Vrh (337m), and the Kamiškarta bay, 120 meters under the cave. 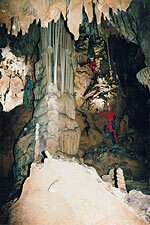 Stalactites and stalagnites are build at a very slow pace, only one milimetere per year. That means that the central stalactite in the Big Hall, which is 6 meters tall, needed 6000 years to be built. Now, after 6000 years of creation, the 6 meters tall central stalactite looks like he is holding the whole dome above him. In the Big Hall there are 44 piers in various widths and heights ranging from 2 to 8 meters. The cave entrance wasn't visible in the beginnings, a strong earthquake made him look the way he looks today. So far only 4 halls have been explored. The Big Hall is 30 meters deep and has 20 meters in height and 2 to 8 meters in width. There are stilll speculations about the whole lenght of the cave. There is an old story among thepeople of Dugi Otok. A cat was released in the cave and was foundcoming out of the earth some 12 km away in the Stržna bay. The cave itslef is very old. There is an assumption that she is between 10000 and 15000 years old. 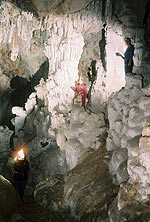 The cave "Strašna Peć" has one part reaching under the sea level. Back in the old days the Kornati islands and Dugi Otok were all part of one mainland. When the sea level rised, the islands as we know them today were created. Among the archeological materials found in the cave, there was the armour (hoists) from the period of Neolithic. Neolithic lasted from 12000. to 6000. year before Christ, which is a proof of how old is the cave. As for the fauna living in the cave, there are bats and pigeons that nest in this cave. The temperatures in the summer periods vary. In front of the entrance they reach 37 Celsius and in the Big Hall the temperatures are similar. At lower levels it is about 18 Celsius and at the very bottoms it goes down to refreshing 10 degrees Celsius.